"Can we get something going on it" is a great request, did you have some more details? Are you offering to send us one so we can use it for testing? Thanks!! That is a generous donation. Otherwise, you are welcome to try it and let us know how it works. The other B250 boards work great! I'm using the Asus B250 Mining Expert right now, but I only have 3 GTX1070 and one 1060. I just started mining a month ago so I'm still waiting for price drop on GPU. Even though 1070 price is lower now, but I don't want to buy so many at the moment because 1070Ti will release in a couple weeks, if 1070Ti has better hash rate, I will build my rig base on 1070Ti, unless the 1070Ti has bad hash rate like 1080 and cost $100 more than the regular 1070. Have there been any updates on the VEGA support front? You want to send me one? Maybe we can chat directly but what if I put the card in my Pimp box and give you remote access? Sorry, AMD does not have valid drivers that work for VEGA mining on linux. PiMP DevOps is proud to say: We are working on Vega support! Also, we have made a new category Feature Requests so you can easily tell us what we need to be working on so you have the best mining tools around. Moving this topic there. Thanks!!! apparently the 1070TI isn't much faster for mining. The Nvidia cards are very profitable for Equihash. Any updates on Vega support? I think this link shows that there was some update for vegas or "newer AMD cards only"
"Added grub boot menu item "PiMP with VEGA support", this enables new kernel DC mode driver for newer AMD cards only." The caveat is you may have to reimage to the appropriate version on the SSD and re-apply your key. We need to point out that Linux VEGA support is pretty limited right now. Getting things working requires some linux knowledge, such as configuring GRUB, setting up unique environments, and some special BIOS qualifications. Also requires on VEGA in a platform, and use of at least x8 PCI slots. If you have a VEGA board, hunt me down on Discord and we can chat through the requirements. AMD has published a roadmap that brings better support for VEGA and Ravenridge product over the next few months. We are dependant on AMD to complete this work though, as those parts are closed source and can only be used by us after release from AMD. Expect full support soon! 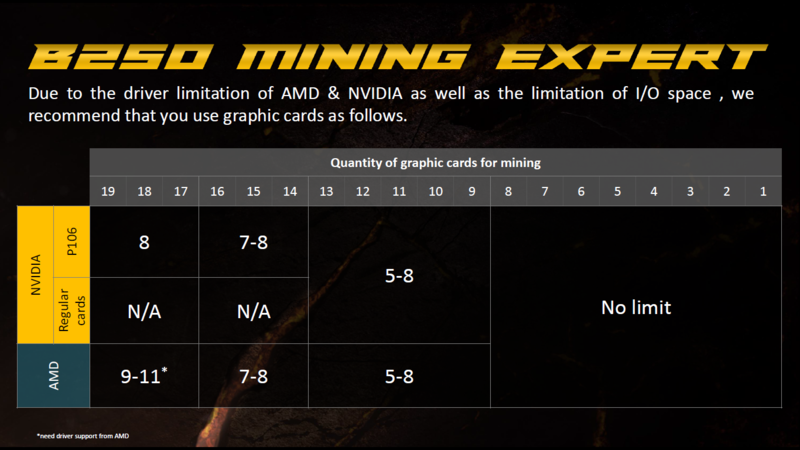 As for 19 GPUs on a single B250 mining expert.. That also needs support from the vendors, mining applications, and drivers. When the B250 BIOS code supports all 19 GPUs online of just one make and model, we will be a lot closer. But please follow the board makers directions for laying out GPUs please, we cannot change that. I personally do not understand the fascination with using just one MB to drive so many GPUs. To get the density, they use lots of little bridges. And when I use the same bridges, it causes me lots of issues. Memory transfer rates drop drastically on some memcopy intensive algorithms. For example, Cryptonight drops by about 1/5th the speed when the GPUs mining it are behind a 4:1 PCIe bridge. Another issue with such GPU density on a single MB, is the power requirements for a single rig. If you have 19 VEGAS say, into one board.. you could be pushing 7,000 watts of power. The average hobby miner would never want todo that. Besides the power, you have the fault management. If one GPU fails out of 19, and you need to reboot. You have to take all of them offline to handle that. All mining stops on all cards when you take an outage for anything. Regardless, the answer for both of these questions is simply that we need better support from the vendors to insure these cards and mb works right.